Dimevision Vol 2: Roll With It Or Get Rolled Over DVD with Deluxe Book Out Now! Once again, Santa Ana's Observatory OC (3503 S. Harbor Blvd) will host a massive DIMEBASH, fueled by Monster Energy, on January 24, 2019. The event will be hosted by Sirius XM's Jose Mangin, and in addition to Monster Energy, is sponsored by Affliction, Metal Blade Records, Dean Guitars, ddrum, California's Finest and BackBeat BBQ. 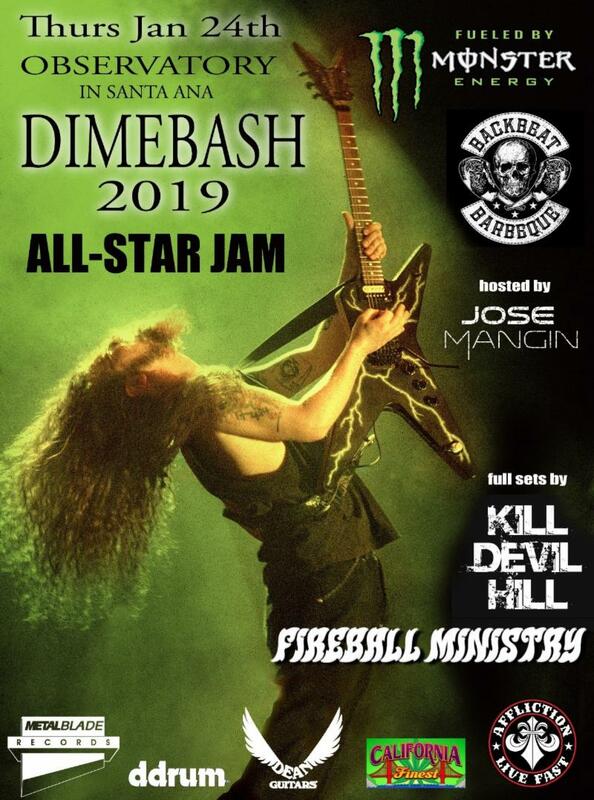 DIMEBASH will feature performances by Kill Devil Hill and Fireball Ministry, followed by an all-star jam featuring members to be announced performing Dime's music and his favorite tunes. Doors open at 7:00 p.m. and the all ages event starts at 8:00 p.m.
Tickets are available NOW via Ticketweb. A private afterparty will take place after the main event featuring Dave Grohl's BackBeat BBQ cooking up a monstrous feast for all in attendance, and tons of great raffle prizes will be available to win throughout the night. Details on how you can win a seat at a private afterparty table are coming soon. Rita Haney said, "The thing that I look forward to most about Dimebash is how it doesn't matter if you're up on the stage jammin' or if your standing in the crowd - we're all just one big bunch of fans together, here to pay our respects to the same man for the love, the laughs, and the killer tunes he created with that power groove of his! Lots of fun is had in that room on that one night - you never know the combinations of talent you're going to see! It's pretty damn magical." Right now, fans can order "Dimevision Vol 2: Roll With It Or Get Rolled Over," the follow up to the poignant first Dimebag Darrell video memorial set, "Dimevision Vol 1: That's The Fun I Have," via Metal Blade Records. "Dimevision Vol 2: Roll With It Or Get Rolled Over" is a true celebration of Dimebag and how he lived his life. The DVD/CD set - which includes more footage, true gems and classic moments - also includes five previously unreleased demos, picked from a vast catalog Dimebag accrued since longtime girlfriend Rita Haney gave him his first 4-track in 1984. Dimebag's personally-written lyrics, dates and notes on those tracks are also included. You can order the "Dimevision Vol 2: Roll With It Or Get Rolled Over Deluxe Book" version now via IndieMerch.